Fellow calculator collector Marie Lisa Collas surprised us in December 2015 with this unusual looking SR-50 manufactured for Dismac Industrial S.A. in Brazil. 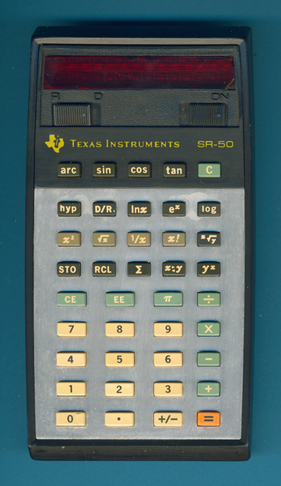 Texas Instruments changed the appearance of the original dramatically by simply switching the silver colored aluminum bezel from the display frame to the keyboard. The discovery of this unique calculator could even solve the mystery of our Frankenstein SR-50 discovered already in 2011 by Marie Lisa Collas. Disassembling this SR-50 manufactured in December 1974 by Texas Instruments in Almelo, The Netherlands reveals the original printed circuit boards (PCB's) centered around the TMC0501 building blocks with the Arithmetic chip and the SCOM (scanning read only memory) surrounded by some discrete logic and the display drivers. © Joerg Woerner, May 29, 2016. No reprints without written permission.